We are dedicated to crafting the finest Staunton style chess pieces for anyone looking for quality and distinction in their living and playing environment. The Mark of Westminster®represents the best chess sets you can buy today. Plain and simple! The story begins during a time when there were few design standards in the style of chess sets; the period prior to the mid-1800's. Chessmen came in many forms and none of these forms followed any particular standard. Although many showed a very refined degree of craftsmanship, few where easily recognizable to all chess players. Also, most of these early designs like the Calvert, St. George, Northern Upright , and particularly one style called Barleycorn, tended to be fragile and very unstable. Many a player was distracted during game play, when his or his rival's king would topple from the slightest shake of the table knocking over any surrounding pieces. One can be quite sure many circumstances arose where a player, not familiar with a particular set of chessmen, inadvertently mistook one piece for another, and created a major "Faux-Pas", or at least had his ego momentarily bruised. Enter Nathaniel Cook and John Jaques, who, during the years of 1849-50, designed and produced, respectively, the first Staunton style chess sets; the name having been adopted from the endorsement of Howard Staunton. His endorsement, since he was considered by some (particularly himself) to be the strongest player of that period, added tremendous credibility to the new design. It soon established itself as the paradigm in design style and craftsmanship. It is now the basis for nearly all tournament chess pieces used today. 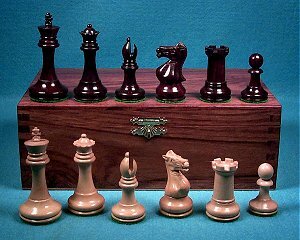 Over the years, many manufacturers have produced chess sets based on the Staunton standard, most of which unfortunately where of vastly inferior quality. Conversely, there have been a few that still produce chess sets of the higher quality, including the company responsible for bringing this style to the chess community, John Jaques and Son of London, and the continued development by the House of Staunton® and others. The respect towards this tradition is what we hope will be recognized by the introduction of our chess pieces. Distinction & Quality ... What we do! In recent years, there have been many chess piece collections available utilizing variations of the Staunton design. 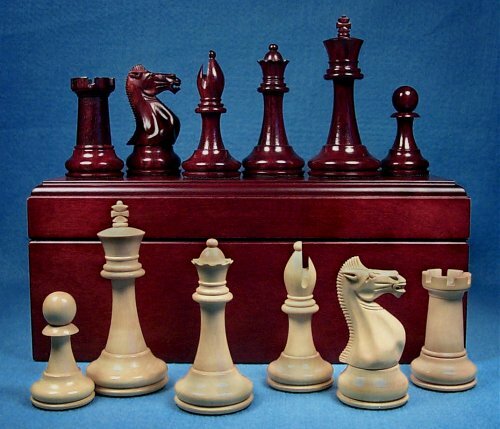 Due to market demands, most of these sets only fulfill the role of being chess pieces, but do not show any refinement in terms of their wood selection, craftsmanship in carving, weighting, and quality of storage. For the chess player with discerning taste and a refined appreciation for this art form, a few chess sets companies exist that really standout, like Jaques and House of Staunton®, two fine chess piece manufacturers indeed. The Mark of Westminster® collection is a new entry in this long tradition of high quality chess piece manufacturing. The Super Grand (4" Burgandy Rosewood pictured above, with cherry box) has the heaviest pieces with the kings weighing 5 oz., 4 oz., and 2.5 oz. respectively, leather covered bases, and is available in Rosewood and Ebony. The set also includes a special cedar lined Cherry storage box. The Grand has kings weighing 4 oz, 3 oz, and 2.5 oz respectively, leather covered bases, and is available in Burgandy Rosewood and Ebony. The Premier is nearly identical to the Grand series, but is only available in a stained black Boxwood and is packaged with an East Indian Rosewood storage box. It is the most economical, high quality chessmen we offer. The Tournament is designed with the tournament or club player in mind. Available in Sheesham, Rosewood, and Ebony the Tournament Series give the club player many choices of color and economy. It is the most economical series of chessmen we offer and are designed to be very handsome, but not so delicate as to be fragile. The most elegant travel set you probably will ever see. (Unless we design something nicer). Quality and distinction defined ... How we do it! 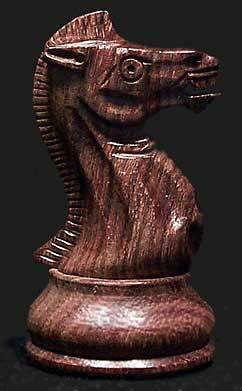 The carving of a chess piece is the first recognized "mark" of quality. It is the carver's skill that sets one chess piece collection apart from the rest. At The Mark of Westminster®, we searched the world for the best craftsmen to carve our chess pieces to extremely high standards. These artisans, most of which are descendants of generations of chess piece carvers, we consider to be the best of the best. They represent an eclectic mix of artisan craftsmen who are able to carve chess pieces to our exacting standards. We have not just made a poor recreation of previous chess sets, but instead, have taken a close look at many of the carving permutations of the classic Staunton designs, and utilized the best features from each. 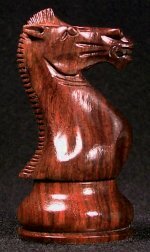 We have taken these features and brought them together to produce a chess piece collection of unique and outstanding artistry, and at the same time maintaining a traditional Staunton style appeal. To reiterate, we have not done cheap, poor quality copies of Jaques or House of Staunton®, but have tried to pay homage to these designs and brought together the best attributes of all these designs and maintain a level of quality in line with them. Hand selecting blocks of wood to carve the chess pieces takes the experience of a skilled carver. Understanding the grain, the directions it can take within the wood, and an intuitive understanding of the orientation of that block before initiating the first cut, is crucial when hand carving a premier chess piece. Our craftsmen are highly skilled in their intuitive understanding of how to approach and complete each carving, and this shows in the quality of chess pieces they produce for us, and inevitably for every owner of The Mark of Westminster® chessmen. Many chess pieces available today offer a stamping on the white king's knight and rook. This we consider a vestigial throwback to the 1849 Jaques concept. Using the old notation systems, pieces were referenced to there originating positions, and, therefore marking these pieces with some type of reference symbol was desirable. Other current makers of low quality chess pieces do this as a way of copying quality companies like Jaques and House of Staunton®. Although the current modern notation makes this type of identification not essential, we have placed a special "mark" on the white kings base exclusively. This identifies the set as a true Mark of Westminster® chess piece collection and makes this collection unique, relatively speaking, and most importantly modern in its function and form. In reality, we added it because we think it just looks very elegant! The selection of woods is also a critical choice and determines not just the coloration, but the aesthetic texture and character of each chess piece as well. We have decided to offer our chess pieces in three wood types; Boxwood for the white pieces, and Rosewood or Ebony for the black. There are many other exotic woods to choose from in the world, but we feel that these represent the most popular, as well as having the best carving properties of all the world's exotic wood types. Keeping in mind our commitment to traditional appeal, these woods also have played a very traditional role in chess piece design, carving and finishing. The following details the exact species of woods we use, and why we have chosen them for our chess pieces. The Boxwood we are using for our white pieces is from the species of tree scientifically known as Gossypiospermum praecox, commonly known as West Indian Boxwood. This species of wood is reported to grow in the Dominican Republic, the Maracaibo Lake region of Venezuela, and in eastern Colombia, the latter being our source. It is usually found on dry chalky or rock slopes. Its texture is very fine and uniform. It has a generally straight grain, with a very high luster. It can be turned on a lathe very easily, and its carving characteristics are described as excellent. Its coloring is usually a very light yellow brown, with a hint of red tones. All of these characteristics makes this Boxwood an excellent choice for the light chess pieces. The Burgandy Rosewood we use is from a species of tree scientifically known as Dalbergia latifolia , commonly known as East Indian Rosewood, Malabar, and Bombay Blackwood, to name a few. Dalbergia is the genus that generally denotes all Rosewood species worldwide, but our wood is indigenous to India. It is found in the dry deciduous forest throughout the Indian peninsula. It grows in the sub-Himalayan tract from Oudah eastwards to Sikkim, Bihar, Orissa, and throughout central and southern India. Optimum growing conditions are reported to be in the Bombay region, which is the source for our Rosewood. The wood is supposed to be fairly difficult to carve and work by hand, which says a great deal for the skill of our craftsman. The color of this wood has a rose to dark brown color with darker purple lines. The darker streaks impart an attractive figure to the wood. The crossed, narrowly interlocked grain, with the combinations of darker streaks gives the wood a very attractive appearance. This wood, with proper preparation, also has excellent finishing and polishing characteristics. This wood is something just a little different from other Rosewoods used in competing chess sets, with its skew towards a slight burgundy coloring, making The Mark of Westminster® Rosewood chess pieces much more distinctive. The source of the coloring is due to the fact that the wood used is harvested from the root of the tree. We also use the normal timber of this species for our Tournament Series. Our Ebony comes from a tree scientifically known as Diospyros melanoxylon, commonly known as East Indian Ebony, Marblewood and Tendu, to name a few. The species is common in the deciduous forests of the Central providences, Chota Nagpur, Behur, southern India, and the whole Indian Peninsula. The heartwood, which is part of the tree we use, is a deep and slightly grained black in respect to its color. It is more brittle than the sapwood. The grain is commonly straight, sometimes irregular. The texture of the wood is fine and even. The black heartwood is very resistant to decay, so the longevity of this wood is excellent. This wood exhibits excellent finishing and polishing characteristics. Once again this is a tough wood to carve, but our craftsman are very familiar with the problems and are masters at working this hardwood with hand tools. The deep luster and total blackness of the blocks we select make for exceptional, true black chess pieces. 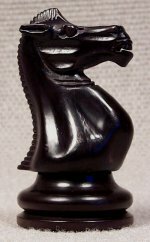 Ebony is one of the traditional woods used in chess pieces, but we added distinctiveness by utilizing one of the darkest black ebonies available. All series are available in this wood. Finally, our Tournament Series is available in Sheesham. This easy to carve wood is one of the most popular woods used in the manufacture of chess pieces. Its economy, lovely color and figure make it very attractive to the budget concious consumer. It is also a very durable wood, lending itself very nicely to the travel style chess piece. Sheesham, is usually of the species (Dalbergia sissoo). Sheesham (D. sissoo ) is reported to occur throughout the sub-Himalayan region, from the Indus to Assam, usually at elevations of up to 2950 feet (900 m), but sometimes at 4900 feet (1500 m). It often grows in mixed stands on new alluvial lands or low banks of rivers. The tree is also reported to be widely planted in many parts of India, especially in the Punjab, Uttar Pradesh, West Bengal, and Assam. It is also reported to be an introduced species in Nigeria. Large supplies of the timber are reported to be available from Uttar Pradesh and the Punjab, while limited quantities can be obtained from West Bengal and Assam, all in India. The heartwood is described as golden brown to deep brown in color, with darker streaks that give the wood an attractive appearance. The wood is hard, with a uniform and medium coarse texture. Natural resistance to decay is reported to be very high, and the heartwood is reported to be rarely attacked by borers and ants. Carving properties are reported to be very good, and it is considered to be one of two most popular carving and engraving woods in India. Sheesham is reported to be a good turnery wood. All of these properties, and its relative low cost, made this wood an excellent choice as one of the choices for our Tournament Series. Incidentally, as a matter of policy we do not use woods from rare or endangered species of trees (as done by many wood product companies to raise the inherent value of their products, and therefore the selling price). Fortunately, we do not have to. Our woods are derived from species that are not only grown in managed forests, but are also relatively secure in their natural habitats. Our wood selection helps makes The Mark of Westminster® chessmen collection outstanding in its color, grain, finish, and therefore, its distinctiveness. After carving, our chess pieces are hand sanded and polished. Then an exclusive lacquer finish is applied in three steps, with extremely fine buffing being done between each application of lacquer. The pieces are then hand polished. This finishing process yields a beautiful semi gloss, high luster figure. Our finishing is the best in the industry. Bringing out the full luster of the carefully selected woods is our primary goal, with durability and chip resistance being considered with equal import. You simply will not find a better finished chess piece collection than one made by The Mark of Westminster®. The weighting above is for the kings. The weighting and balance of the remaining pieces is then carefully chosen to be a proportional amount, relative to their size versus the king. This weighting and balance makes our chessmen not only practical, but intrinsically more desirable. Well executed, heavy Perimeter Weighting is another feature you will find in The Mark of Westminster® chess pieces. One aspect we decided early on in the development of these chess pieces was that every set would include a high quality storage box. These boxes where chosen for the obvious practical need for storage, but also for their aesthetic appeal. For our Super Grand series, we have a special, luxurious Cherrywood storage box. The box interior is lined top and bottom with a fine billiard cloth. The interior of the box is constructed with cedar. This is done for several reasons. First of all, it helps retard fungus from growing on the pieces when they are stored for an extended period of time, preserving both the finish and the leather pads on the underside of the pieces. In addition, it retards the possibility of wood boring creatures from attacking your valued pieces. The hinges are 14k gold plated, full quadrant types. These are the strongest and most reliable hinges available, not to mention extremely attractive. These hinges are not visible on the outside of the box when closed, but, when the box is open their luxurious 14k gold finish makes for a very rich feel. These hinges also keep the lid open, since they open to 85 degrees and allow gravity to keep the top of the box resting naturally in an opened position. As far as a lock is concerned, after much debate, we decided not to include one. Our thinking is this. What happens if you lose the key, especially if you have the pieces stored for an extended period of time. Besides , if someone wants to take your pieces, they will take this beautiful storage box as well. Quite frankly, the box is so nice we know you will find space in your floor safe for the pieces, as well as this luxurious storage box. Quality and distinction realized ... Why we do it! We wanted to bring to the chess community the absolute finest chess pieces and accessories. This was our mission, and with the introduction of our Super Grand series, we have accomplished this. These are the chess pieces that will fulfill the dreams of the person who demands the absolute finest. At the same time we have addressed the needs of other players whose tastes are just as discerning but are looking for a collection of pieces that is more economical. This is where our Grand and Premier series come into their own. We know that our chess pieces are the finest you can own. Prove this to yourself; become an owner of one of The Mark of Westminster chess piece collections today! Watch for future The Mark of Westminster® products ranging from Chessboards to wood polishes!